Turpan (simplified Chinese: 吐鲁番; traditional Chinese: 吐魯番; pinyin: Tǔlǔfān; Uyghur: تۇرپان, Турпан‎, ULY: Turpan, UYY: Turpan? ), also known as Turfan or Tulufan, is a prefecture-level city located in the east of Xinjiang, People's Republic of China. It has an area of 69,324 square kilometres (26,766 sq mi) and a population of 570,000 (2003). Turpan has long been the centre of a fertile oasis (with water provided by the karez canal system) and an important trade centre. It was historically located along the Silk Road, at that time other kingdoms of the region included Korla and Yanqi. The name Turfan itself however was not used until the end of the Middle Ages - its use became widespread only in the post-Mongol period. The center of the region has shifted a number of times, from Yar-Khoto (Jiaohe, 10 km to the west of modern Turpan) to Qocho (Gaochang, 30 km to the southeast of Turpan), and to Turpan itself. Historically, many settlements in the region have been given a number of different names, some of which refer to more than one place – Turpan/Turfan/Tulufan is one such example. Others include Jushi/Gushi, Gaochang/Qocho/Karakhoja, and Jiaohe/Yarkhoto. Korla, Kucha, and Turfan were inhabited by Tocharians. The peoples of the Kingdoms of Nearer and Further Jushi were closely related. It was originally one kingdom called Gushi, which the Chinese conquered in 107 BC. It was subdivided into two kingdoms by the Chinese in 60 BC. During the Han era the city changed hands several times between the Xiongnu and the Han, interspersed with short periods of independence. 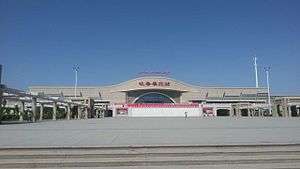 Nearer Jushi has been linked to the Turpan Oasis, while Further Jushi to the north of the mountains near modern Jimasa. Many Han Chinese along with Sogdians settled in Turfan during the post Han dynasty era. The Chinese character dominated Turfan in the eyes of the Sogdians. Kuchean-speakers made up the original inhabitants before the Chinese and Sogdian influx. The oldest evidence of Chinese characters were found in Turfan from a document dated to 273 AD. The Tang dynasty had reconquered the Tarim Basin by the 7th century AD and for the next three centuries the Tibetan Empire, the Tang dynasty, and the Turks fought over dominion of the Tarim Basin. Sogdians and Chinese engaged in extensive commercial activities with each other under Tang rule. The Sogdians were mostly Mazdaist at this time. The Turpan region was renamed Xizhou (西州) when the Tang conquered it in 640 AD, had a history of commerce and trade along the Silk Road already centuries old; it had many inns catering to merchants and other travelers, while numerous brothels are recorded in Kucha and Khotan. As a result of the Tang conquest, policies forcing minority group relocation and encouraging Han settlement led to Turpan's name in the Sogdian language becoming known as “Chinatown” or "Town of the Chinese". In Astana, a contract written in Sogdian detailing the sale of a Sogdian girl to a Chinese man was discovered dated to 639 AD. Individual slaves were common among silk route houses; early documents recorded an increase in the selling of slaves in Turpan. Twenty-one 7th-century marriage contracts were found that showed, where one Sogdian spouse was present, for 18 of them their partner was a Sogdian. The only Sogdian men who married Chinese women were highly eminent officials. Several commercial interactions were recorded, for example a camel was sold priced at 14 silk bolts in 673, and a Chang'an native bought a girl age 11 for 40 silk bolts in 731 from a Sogdian merchant. Five men swore that the girl was never free before enslavement, since the Tang Code forbade commoners to be sold as slaves. 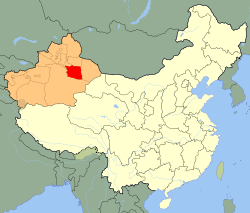 The Uyghurs established a Kingdom in the Turpan region with its capital in Gaochang or Kara-Khoja. The kingdom was known as the Uyghuria Idikut state or Kara-Khoja Kingdom that lasted from 856 to 1389 AD. The Uyghurs were Manichaean but later converted to Buddhism and funded the construction the cave temples in the Bezeklik Caves. 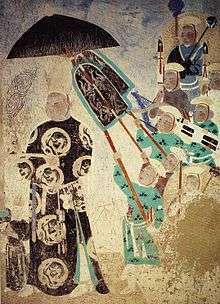 The Uyghurs formed an alliance with the rulers of Dunhuang. The Uyghur state later became a vassal state of the Kara-Khitans, and then as a vassal of the Mongol Empire. This Kingdom was led by the Idikuts, or Saint Spiritual Rulers. 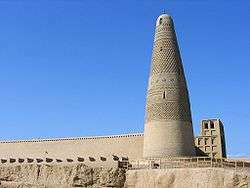 The last Idikut left Turpan area in 1284 for Kumul, then Gansu to seek protection of Yuan Dynasty, but local Uyghur Buddhist rulers still held power until the invasion by the Moghul Hizir Khoja in 1389. The conversion of the local Buddhist population to Islam was completed nevertheless only in the second half of the 15th century. 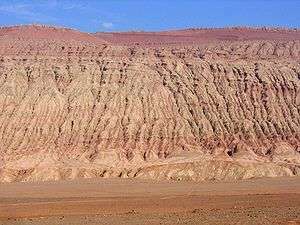 Turpan has a harsh, drastic, cold desert climate (Köppen BWk), with very hot and long summers, and very cold but short winters, and brief spring and autumn in between. Between the month of March and October, the climate closely resembles a hot desert climate (BWh). Annual precipitation is very low, amounting to only 15.7 millimetres (0.62 in). The monthly 24-hour average temperature ranges from −7.6 °C (18.3 °F) in January to 32.2 °C (90.0 °F) in July, or a very large seasonal variation of 39.8 °C (71.6 °F); the annual mean is 14.4 °C (57.9 °F). With monthly percent possible sunshine ranging from 48% in December to 75% in September, sunshine is abundant and the city receives 2,912 hours of bright sunshine annually. Extremes have ranged from −28.9 °C (−20 °F) to 48.1 °C (119 °F), although a reading of 49.6 °C (121 °F) in July 1975 is regarded as dubious. 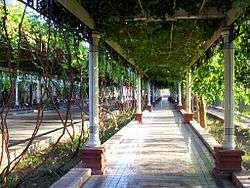 However, the very heat and dryness of the summer, when combined with the area's ancient system of irrigation, allows the countryside around Turpan to produce great quantities of high-quality fruit. ↑ Denis Sinor (1997). Inner Asia. RoutledgeCurzon. p. 121. ISBN 978-0-7007-0896-3. ↑ Svat Soucek (2000). A History of Inner Asia. Cambridge University Press. p. 17. ↑ Hill (2009), p. 109. ↑ Grousset, Rene (1970). The Empire of the Steppes. Rutgers University Press. pp. 35, 37, 42. ISBN 0-8135-1304-9. ↑ Hill (2009), p. 442. ↑ Baij Nath Puri (December 1987). Buddhism in Central Asia. Motilal Banarsidass. p. 70. ISBN 978-8120803725. ↑ Valerie Hansen (2015). The Silk Road: A New History. Oxford University Press. pp. 83–. ISBN 978-0-19-021842-3. 1 2 3 HANSEN, Valerie. "The Impact of the Silk Road Trade on a Local Community: The Turfan Oasis, 500-800" (PDF). Yale University Press. Retrieved 2010-07-14. ↑ Xin Tangshu 221a:6230. In addition, Susan Whitfield offers a fictionalized account of a Kuchean courtesan's experiences in the 9th century without providing any sources, although she has clearly drawn on the description of the prostitutes' quarter in Chang’an in Beilizhi; Whitfield, 1999, pp. 138-154. ↑ Wang, Y (1995). "A study on the migration policy in ancient China". Chin J Popul Sci. 7: 27–38. PMID 12288967. ↑ Wu Zhen 2000 (p. 154 is a Chinese-language rendering based on Yoshida's Japanese translation of the Sogdian contract of 639). ↑ Rong Xinjiang, 2001, pp. 132-135. Of the 21 epitaphs, 12 are from Quan Tangwen buyi (supplement to the complete writings of the Tang), five from Tangdai muzhi huibian (Collected epitaphs of the Tang), three were excavated at Guyuan, Ningxia, and one is from another site. ↑ Yan is a common ending for Sogdian first names meaning ‘for the benefit of’ a certain deity. For other examples, see Cai Hongsheng, 1998, p. 40. ↑ Ikeda contract 31. Yoshida Yutaka and Arakawa Masaharu saw this document, which was clearly a copy of the original with space left for the places where the seals appeared. ↑ Jian Li; Valerie Hansen; Dayton Art Institute (January 2003). The glory of the silk road: art from ancient China. Memphis Brooks Museum of Art. The Dayton Art Institute. p. 35. ISBN 978-0-937809-24-2. ↑ Valerie Hansen (11 October 2012). The Silk Road. OUP USA. pp. 11–. ISBN 978-0-19-515931-8. ↑ Zsuzsanna Gulácsi (2005). Mediaeval Manichaean Book Art: A Codicological Study of Iranian And Turkic Illuminated Book Fragments from 8th-11th Century East Central Asia. BRILL. pp. 19–. ISBN 90-04-13994-X. ↑ Li Tang; Dietmar W. Winkler (2013). From the Oxus River to the Chinese Shores: Studies on East Syriac Christianity in China and Central Asia. LIT Verlag Münster. pp. 365–. ISBN 978-3-643-90329-7. ↑ Ludwig Paul (January 2003). Persian Origins--: Early Judaeo-Persian and the Emergence of New Persian : Collected Papers of the Symposium, Göttingen 1999. Otto Harrassowitz Verlag. pp. 1–. ISBN 978-3-447-04731-9. ↑ ROSSABI, M.. 1972. “MING CHINA AND TURFAN, 1406-1517”. Central Asiatic Journal 16 (3). Harrassowitz Verlag: 212. http://www.jstor.org/stable/41926952. ↑ Morris Rossabi (28 November 2014). From Yuan to Modern China and Mongolia: The Writings of Morris Rossabi. BRILL. pp. 45–. ISBN 978-90-04-28529-3. ↑ Bellér-Hann., Ildikó (1995), A History of Cathay: a translation and linguistic analysis of a fifteenth-century Turkic manuscript, Bloomington: Indiana University, Research Institute for Inner Asian Studies, p. 159, ISBN 0-933070-37-3 . Christianity is mentioned in the Turkic translation of Ghiyāth al-dīn's account published by Bellér-Hann, but not in the earlier Persian versions of his story. ↑ Trudy Ring; Robert M. Salkin; Sharon La Boda (1996). International Dictionary of Historic Places: Asia and Oceania. Taylor & Francis. p. 323. ISBN 1-884964-04-4. Retrieved 2010-06-28. ↑ Luther Carrington Goodrich; Chao-ying Fang (1976). Dictionary of Ming Biography, 1368–1644. Columbia University Press. p. 1038. ISBN 0-231-03833-X. Retrieved 2010-06-28. ↑ Jonathan D. Spence; John E. Wills, Jr.; Jerry B. Dennerline (1979). From Ming to Ch'ing: Conquest, Region, and Continuity in Seventeenth-Century China. Yale University Press. p. 177. ISBN 0-300-02672-2. Retrieved 2010-06-28. ↑ Younghusband, Francis E. (1896). The Heart of a Continent, pp. 139-140. John Murray, London. Facsimile reprint: (2005) Elbiron Classics. ISBN 1-4212-6551-6 (pbk); ISBN 1-4212-6550-8 (hardcover). ↑ Grigory Grumm-Grzhimaylo (Г. Грум-Гржимайло), East Turkestan (Восточный Туркестан), in Brockhaus and Efron Encyclopedic Dictionary. (Russian) (The original quote: «Турфан же славится и своим изюмом, который можно считать лучшим в мире (высушивается в совершенно своеобразного типа сушильнях))», i.e. "Turfan is also famous for its raisins, which may be deemed the best in the world. They are dried in drying houses of a completely peculiar type". ↑ The Geographical Journal. Royal Geographical Society. 1907. pp. 266–. 1 2 3 中国地面国际交换站气候标准值月值数据集（1971－2000年） (in Chinese). China Meteorological Administration. Retrieved 2010-04-03. ↑ "Turfan". Global Volcanism Program. Retrieved 21 August 2011. ↑ "Extreme Temperatures Around the World". Retrieved 2010-08-28. ↑ Abdurishid Yakup (2005). The Turfan Dialect of Uyghur. Otto Harrassowitz Verlag. pp. 174–. ISBN 978-3-447-05233-7. ↑ Joanne N. Smith Finley (9 September 2013). The Art of Symbolic Resistance: Uyghur Identities and Uyghur-Han Relations in Contemporary Xinjiang. BRILL. pp. 309–. ISBN 978-90-04-25678-1. ↑ Justin Jon Rudelson; Justin Ben-Adam Rudelson (1997). Oasis Identities: Uyghur Nationalism Along China's Silk Road. Columbia University Press. pp. 141–. ISBN 978-0-231-10786-0. ↑ Justin Jon Rudelson; Justin Ben-Adam Rudelson (1997). Oasis Identities: Uyghur Nationalism Along China's Silk Road. Columbia University Press. pp. 141–. ISBN 978-0-231-10787-7. 1 2 3 "China, Peoples Republic of Dried Fruit Annual 2007" (PDF). Global Agriculture Information Network. USDA Foreign Agricultural Service. ROSSABI, M.. 1972. “MING CHINA AND TURFAN, 1406-1517”. Central Asiatic Journal 16 (3). Harrassowitz Verlag: 206–25. http://www.jstor.org/stable/41926952.